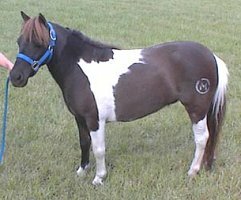 Lady is a gorgeous 32.5" AMHA/AMHR smoky black pinto mare owned by Lauralees Minatures. Smoky black is due to the effect of a single cream gene on a black base coat. It is the darkest form of buckskin and is often now referred to as smoky black to distinguish it from the other forms of buckskin.